The Fun Bazaar is one of the many tents found in Mario Party 8. 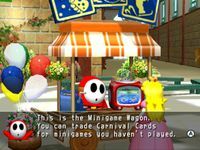 Here characters can spend the Carnival Cards that they have collected via playing through the Party Tent, Star Battle Arena, Minigame Tent, and Extras Zone. The Records Board compiles all of the information on the player's best records on minigames, the player's score in Test for the Best and records of the high scores of the Nintendo staff members in certain minigames. Note that the scores of the Nintendo staff members will not be available for viewing until they are purchased from the Surprise Wagon for 50 Carnival Cards. The Minigame Wagon is a place where the player can buy up to 64 minigames for 50 Carnival Cards each. After completing the Star Battle Arena mode, the Shy Guy merchant who runs the Minigame Wagon will return to work and the player will be free to buy any minigames they haven't unlocked yet. After the player has bought a minigame, or if it has already been unlocked, the words "SOLD OUT" will be printed diagonally across the minigame's picture. 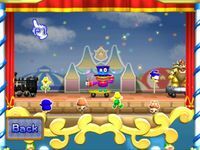 The Carnival Wagon is an area resembling a mini stage that lets the player view all of the different carnival figures that they can purchase in the Surprise Wagon. When the player approaches the Carnival Wagon, they will be presented with two options: "Carnival Figures" or "Carnival Parade." If the player chooses "Carnival Figures," they will be able to view all the carnival figures they currently have lined up on a shelf. If they choose "Carnival Parade," they will see their carnival figures marching in a parade across the stage. When marching in a parade, each figure will appear in random order each time, and will perform an action of some kind when the player clicks on them (note that this will not happen if they are viewed on the shelf). Each figure can only be clicked on once each time the parade is started. DK's Balancing Act The Donkey Kong statue will roll a barrel back and forth on a flat surface without it falling off. DK's Barrel Cannon The Barrel Cannon will fire three separate blasts of fireworks into the sky. Dolphin Shuttle Swirl The dolphin will move back and forth as the waves move under it. Shipwrecked Goombas The ship's cannon will launch a cannonball up into the air, which will fall back into the cannon, causing many Pirate Goombas to fall out of the boat. King Boo's Revenge King Boo will rise into the air and glow before coming back down again. Hideaway Breakout The moon will rise above the house and multiple Red Boos will escape from the front door. Perplexed Chef The Shy Guy chef will burn something in a pan on the stove, and will then spin around while holding the smoking pan. Express Engine The train will release rings of colored smoke from its smokestack as it chugs along. Koopa Crane The arm of the crane will extend and a banner will be released from the claw on the end. Hotel Happiness Multiple coins will be poured into the hotel, and a happy Koopa Troopa bellhop will appear in front of the hotel. Warped Space Shuttle The space ship will fall over onto its side, and Captain Shy Guy will roll out and then stand up and wave. Space Colony Tower Bowser will pull the reverse lever as the tower spins around and multiple spotlights move back and forth. Supershaken Soda A geyser of soda will shoot out of the can, causing a rainbow to appear. Sugar Rush Surprise The strawberry in the middle of the cake will disappear, and a Monty Mole will pop out of the center instead. Bullet Blitzer The helicopter will fly into the air and release multiple Goombas, after which it will come back down. Party Karting The kart will spin around in circles and the back tires will smoke. Spinning Boat Two Shy Guy rowers will row the boat in opposite directions, causing it to spin around counterclockwise. Sweet Saucer The flying saucer will rise up into the air, and then release a large quantity of candy from a yellow beam underneath. Flip the Chimp The chimp will shoot up the trunk of the tree, and then come spiraling back down the trunk again. Big Bob-omb's Blast King Bob-omb will detonate himself and fly into the air while releasing confetti before falling back down again. Baby Penguin Frolic The baby penguins will stand up on the ice platform and dance around. Podoboo Burst The main giant Podoboo will glow and then open up to reveal four smaller Podoboos which will hover over the main one before going back inside it. Potted Piranha Plant The Piranha Plant will spin around in its pot twice. Chain Chomphouse An angry Chain Chomp will emerge from the doghouse and bark repeatedly at the screen. Poppin' Party Tent The top middle section of the Party Tent will fall away, and many colored balloons will emerge from inside it. Star Carnival Stage Sparks will shoot up from either side of the stage, and a paper-thin Ballyhoo will appear in front of it. Barrel of Fun Donkey Kong will pop out of the barrel and spin around. Bowser's Fury Bowser will spin around on his platform and shoot flames out of his mouth. Ballyhoo and Big Top Ballyhoo will tip his hat and speak into his microphone. Test Take Off The Test for the Best hot air balloon will grow much larger, and then float upwards into the sky. The Surprise Wagon sells various items, including Extras Zone minigames, staff records, music and sounds, taunting sounds, staff credits, and carnival figures. After the player has bought an item, the words "SOLD OUT" will be printed diagonally across the item's picture. Table Menace 50 Carnival Cards This is a table-tennis game you can play in the Extras Zone. Puzzle Pillars 50 Carnival Cards This is a puzzle game you can play in the Extras Zone. Chomping Frenzy 50 Carnival Cards This is a Chain Chomp game you can play in the Extras Zone. Moped Mayhem 50 Carnival Cards This is a moped game you can play in the Extras Zone. Very Hard 50 Carnival Cards You can choose Very Hard as a COM difficulty setting. Heckling Voices 50 Carnival Cards You can use heckling voices on boards. Test for the Best 50 Carnival Cards You can play Test for the Best in the Minigame Tent. Staff Best Records 50 Carnival Cards You can see the game designers' best performances at these games! Character Voices 50 Carnival Cards You can hear the voices of characters in this game. Carnival Music 50 Carnival Cards You can hear the sounds from the party boards. Minigame Music 50 Carnival Cards You can hear the sounds from the minigames. Staff Credits 100 Carnival Cards Check out the names of everyone who helped throw this party! DK's Balancing Act 30 Carnival Cards A figure of DK from DK's Treetop Temple. DK's Barrel Cannon 30 Carnival Cards A figure of the DK Barrel Cannon from DK's Treetop Temple. Dolphin Shuttle Swirl 30 Carnival Cards A figure of the Dolphin Shuttle from Goomba's Booty Boardwalk. Shipwrecked Goombas 30 Carnival Cards A figure of the pirate ship from Goomba's Booty Boardwalk. King Boo's Revenge 30 Carnival Cards A figure of the head resident in King Boo's Haunted Hideaway. Hideaway Breakout 30 Carnival Cards A figure of the house from King Boo's Haunted Hideaway. Perplexed Chef 30 Carnival Cards A figure of the hapless chef from Shy Guy's Perplex Express. Express Engine 30 Carnival Cards A figure of the train from Shy Guy's Perplex Express. Koopa Crane 30 Carnival Cards A figure of the crane from Koopa's Tycoon Town. Hotel Happiness 30 Carnival Cards A figure of the 3-Star hotel from Koopa's Tycoon Town. Warped Space Shuttle 30 Carnival Cards A figure of the captain's ship from Bowser's Warped Orbit. Space Colony Tower 30 Carnival Cards A figure of the main tower from Bowser's Warped Orbit. Supershaken Soda 30 Carnival Cards A figure of the soda can from Shake It Up. Sugar Rush Surprise 30 Carnival Cards A figure of the cake from Sugar Rush. Bullet Blitzer 30 Carnival Cards A figure of the battle helicopter from Gun the Runner. Party Karting 30 Carnival Cards A figure of the kartin' action from Kartastrophe. Spinning Boat 30 Carnival Cards A figure of the co-rowed boat from Rowed to Victory. Sweet Saucer 30 Carnival Cards A figure of the UFO from Saucer Swarm. Flip the Chimp 30 Carnival Cards A figure of the monkey from Flip the Chimp. Big Bob-omb's Blast 30 Carnival Cards A figure of King Bob-omb from You're the Bob-omb. Baby Penguin Frolic 30 Carnival Cards A figure of the baby penguins from Glacial Meltdown. Podoboo Burst 30 Carnival Cards A figure of the fiery meanie from Lava or Leave 'Em. Potted Piranha Plant 30 Carnival Cards A figure of the ever-pesky Piranha Plant. Chain Chomphouse 30 Carnival Cards A figure of the Chain Chomp from At the Chomp Wash.
Poppin' Party Tent 30 Carnival Cards A figure of the Party Tent, the home to party-board mayhem! Star Carnival Stage 30 Carnival Cards A figure of the Star Carnival's main stage. Barrel of Fun 30 Carnival Cards A figure of DK, who's always helping out on the boards! Bowser's Fury 30 Carnival Cards A figure of Bowser, who's always wreaking havoc on the boards! Ballyhoo and Big Top 30 Carnival Cards A figure of Ballyhoo and Big Top. Test Take Off 30 Carnival Cards A figure of the balloon from Test for the Best. The Carnival Calliope is the place where the player can go to listen to music and sounds that they have purchased from the Surprise Wagon. It plays all music and sounds from the entire game. However, they must first be purchased at the Surprise Wagon for 30 Carnival Cards each. The Staff Credits booth will show all of the credits of the game to the player after it has been purchased at the Surprise Wagon for 100 Carnival Cards. MC Ballyhoo and Big Top will appear to the right of the Carnival Calliope and ask the player if they would like to see the credits. This page was last edited on July 17, 2018, at 19:28.